If you regularly shop at Waitrose, you are probably aware of their Love Life you count… range which is aimed at those who want to keep an eye on their calorie intake. When it comes to snacks, you can’t get much lower in calories than breadsticks. Waitrose LOVE life you count… breadsticks are baked in Italy and have only 17 calories each. Inside each 125g box you’ll find two individually wrapped cellophane packs, each containing 12 breadsticks. They’re reasonably tall, measuring 25cm x 1cm (just under 10”) and are baked to a medium golden colour with a slight glaze. They also have a firm, crunchy texture which holds together well, making them ideal for firmer dips, like cream cheese. 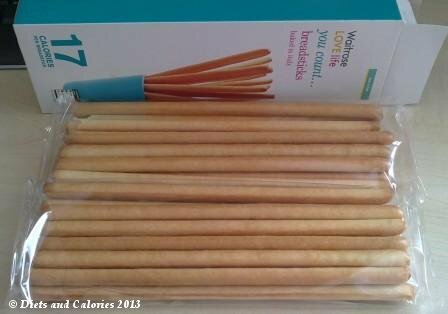 Love Life You Count… breadsticks are baked in Italy for Waitrose and are low in sugar, fat and saturates. Suitable for Vegetarians. Nutrition Information per breadstick: 17 calories, 0.7g protein, 3.5g carbohydrate, 0.2g sugars, trace fat, trace saturates, 0.3g fibre, 0.01g sodium.